A few weeks ago I was laying in bed and a huge light bulb went off in my head. I decided to host a happy hour for only friends with the name Katie(y). I became extremely excited by this idea but as my plan developed, a bubble of worry grew inside me: It was sure to be an awesome night, so I kept thinking of more people I wanted to invite. But they had other names … like Amy, Becky, Laura, Megan, etc. When I expressed my concern about excluding some of these mighty fun friends from the Katie-Exclusive-Party, Brad Pitt put it in the best terms possible. He said …. So, yeah, there you go non-Katie-named friends. That is why you weren’t invited. I suggest you address this issue directly with your mother. The easiest way to spread the invitation was via Facebook, of course. All I had to do was type the letters “KAT” in my search field and all the Katie and Katy named friends popped up. I put together a group message and BAM! The invite was out. 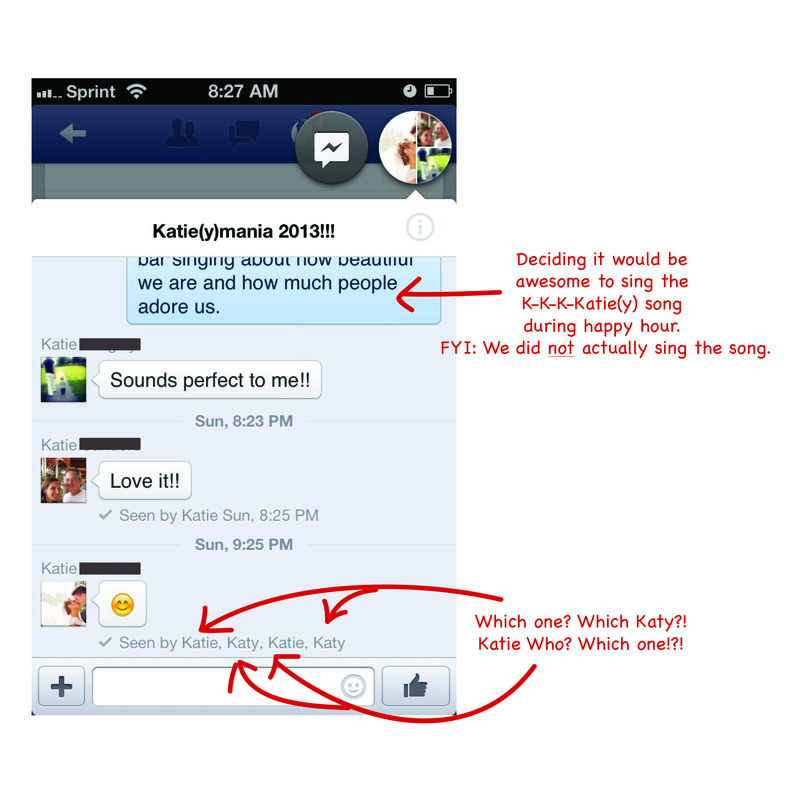 It was fantastic watching the Facebook Messenger update me on who had “seen the message” … Seen by Katie, Katy, Katy, Katie, Katie. I was like “Which one?!? Which one?!? !” It was awesome. Anyway, I was all for calling our happy hour the KKK-Katie(y) Happy Hour but when I typed it out, I had trouble getting past the KKK part. Its not exactly politically correct, you know. So, I quickly decided to forgo that option. Luckily, Katie (which one?! which one?!) suggested Katie(y)mania 2013. That stuck and a few variations took off from there. All in all, the group started with seven Katie(y)s – including me. As the dialogue between all the Katie(y)s continued, more Katie(y)s were invited. If they were named Katie(y) they were added to the list. 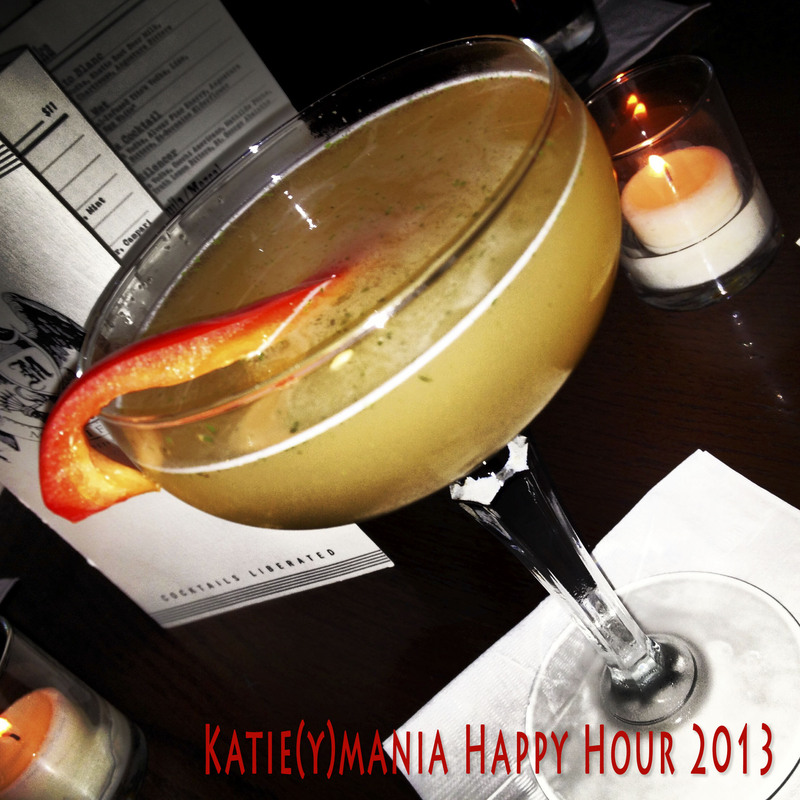 If everyone had been available, we would have had close to 15 Katie(y)s at the Happy Hour. But, life happens …. People got sick. People got stuck at work. People were out of town. We Katie(s) are very busy and important people, so its not surprising that we couldn’t all make the specified date. Which is fine. We are hoping for future dates. In fact, we thought maybe a night of bowling would be fun. Can you imagine a scoreboard full of Katie’s and Katy’s? It would be epic!! All in all, it was a great night that resulted in some interesting discoveries. When I was Facebook searching for all the Katie(y)-named friends, I realized one person was not showing up. So I typed her full name in the search field and when I got to her Facebook page I was hit with reality: That Katie wasn’t a “friend” anymore. I sat there for a second dumbfounded. Not because I was sad. No. I was dumbfounded because I couldn’t remember if I un-friended her or if she un-friended me? Either way, I was ecstatic because we weren’t faking friendship through Facebook anymore. Talk about gaining a sense of online freedom. It was pretty great. Also I didn’t feel obligated to invite her to the Katie(y) Happy Hour. See above statement about faking friendship to understand. All Katie(y)s began with a K and the formal, given name of Katherine/Kathryn was spelled with a K. Except for one Katie. Whose weirdo mother spelled Catherine with a C, but Katie with a K. Guess which Katie has that weirdo mother? One Katie(y)’s last name was Bird. One Katie(y)’s boyfriend nicknamed her KatieBird. They are not the same Katie(y). But in a way, they are. Think on that. One Katie(y) was unable to make it because she had strep throat. Later we found out her formally given name was Kathleen. As a group we decided that she may not be allowed in the club because she should technically be a Kathy. But, then again, we are a pretty nice group of girls, so we will allow her anyway because she does go by Katie(y), not Kathy. She has no idea how lucky she is to avoid exclusion. When we arrived, we were introduced to our server and her name was Katie. I’m not even kidding. What a freak coincidence that could not have been planned any better. Add one more Katie(y) to the group! This entry was posted in Around Town and tagged cocktails, Facebook, food, happy hour, humor, Katie, Katy, photography. Bookmark the permalink.